“A constant refrain for the people of Pyrmont,” says Narelle Macreadie to a real estate agent who’s told her, rather firmly, to leave the apartment she’s being shown. 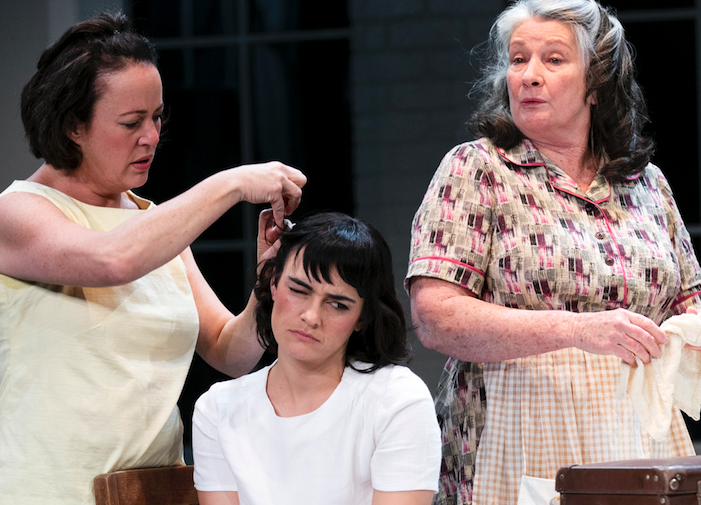 Alana Valentine’s new play The Sugar House is an unapologetically sprawling memory play that moves between rapidly changing Pyrmont in 1966, 1985 and 2007. 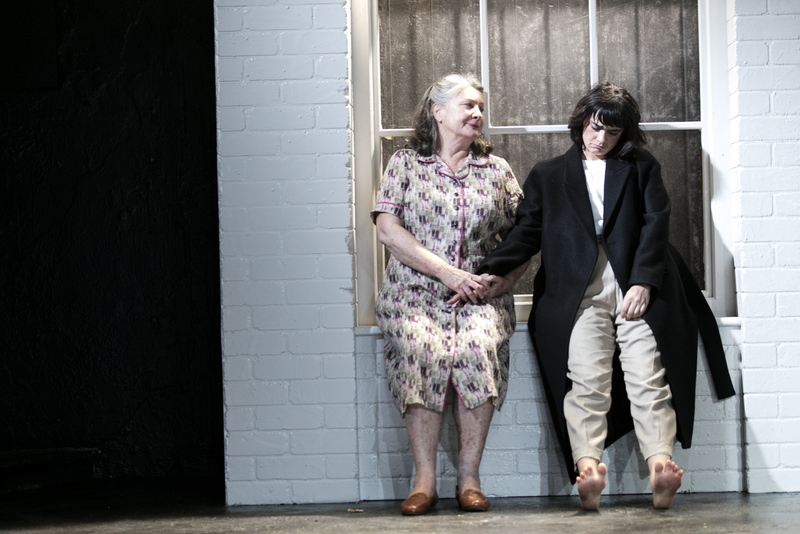 Putting urban redevelopment, social mobility and the increasing expulsion of the working class from inner cities under the microscope, Valentine’s work is clearly and compellingly realised by director Sarah Goodes and a uniformly strong cast in this production for Belvoir. Beginning in 2007 with Narelle, compulsively drawn to an apartment complex that used to be the CSR sugar factory in Pyrmont where her grandfather Sidney used to work, the play tracks the Macreadie family, which is headed up by fierce matriarch June. 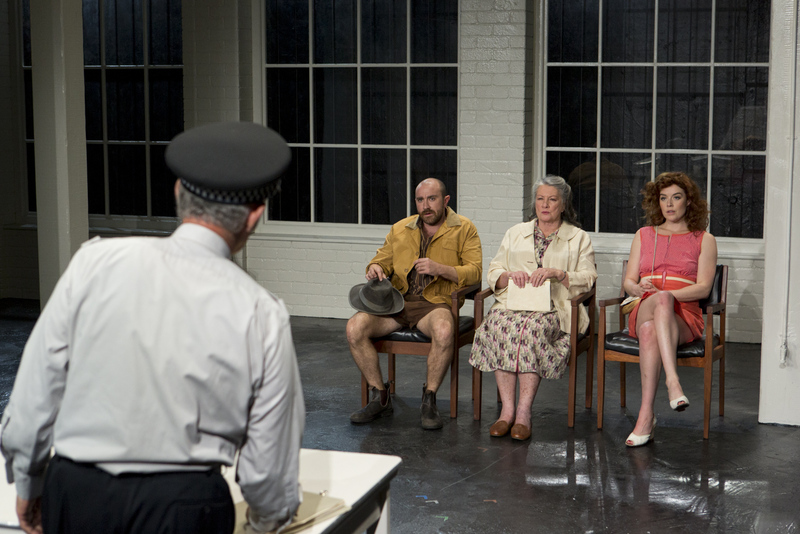 With references to Ronald Ryan, the last man to be put to death by the state in Australia, the criminalisation of poverty is at the heart of this play, foregrounded by June’s son Ollie imprisoned for transporting stolen goods. Terrified of brushes with authority, we learn how June grew up with brothers who chose the money to be made from crime over the backbreaking work and meagre pay available to the working class. She is therefore driven in large part by her hopes for granddaughter Narelle, an investment in a future generation to recoup the felt inadequacies of the past. Narelle is but eight in much of the play’s first half, convincingly pulled off by Sheridan Harbridge who is our entry into this world. There are neat directorial touches by Goodes here – how very well observed it is to have Narelle wrapping a blanket around herself, imitating the older, worldlier Jenny who has been caught in flagrante by police. This subtlety would have been welcome in some of the more soapy exchanges in Valentine’s play, with the characters also tending to speak with the same comic voice. Harbridge is allowed to flex more of her dramatic muscles as an older Narelle, making a particular impression as the restless, raging law student of 1985 who finds June’s expectations stifling. While she gave her strongest performance as this version of Narelle, the character itself felt the most bluntly drawn, her protestations understandable but on the conventional side. Kris McQuade is pitch perfect as the head of the Macreadies – she brings her natural gravitas to the role, her glorious baritone an immediate signifier of her strength and implacability. She also movingly registers June’s class anxieties, with Valentine’s play making it clear how unconnected and therefore unprotected the working poor are in the world. McQuade finds a special rapport with Narelle, in sharp contrast with the strained relationship she has with the flintier Margo, her daughter. Played by Sacha Horler, Margo definitely comes across as underwritten, as do some of the other characters. However, the nuanced performances of the cast lift Valentine’s scanter characterisations, suggesting deep inner lives just out of frame. Although some of the dialogue Horler is given is a little on the nose, her commitment to even the most thesis-like of speeches (as when she talks about not belonging in Pyrmont anymore) elevates the material and ultimately moves the audience. Josh McConville likewise brings depth to Ollie, who could be a rather conventional figure in less capable hands. His explosive outburst when he finds out Narelle has been arrested is frighteningly real, while his comic turn as tattoo artist Zee is understated and all the more satisfying for it. He also brings real pathos to the older Ollie, stooped and rueful. Nikki Shiels gives a lovely, understated performance first as Ollie’s girlfriend and then his long-term partner, tracking realistically the maturing of a spirited 20-something year old into a sedater, slightly world-wearier individual. She also makes apparent how her character has slowly carved out a space for herself in the fractious but close-knit Macreadie clan, patient and sympathetic in her affect and interactions. Shiels is also all hair and handbag as real estate agent Prin, emphasising the historical significance of the area while promising that its “scunginess” has been cleaned up. As well as an affable Sidney Macreadie, Lex Marinos plays a number of roles, each of them nicely distinguished from the other. Like McQuade, he has a natural rapport with eight-year-old Narelle as Sidney and injects just enough menace as corrupt copper Constable Rupert without slipping into caricature. 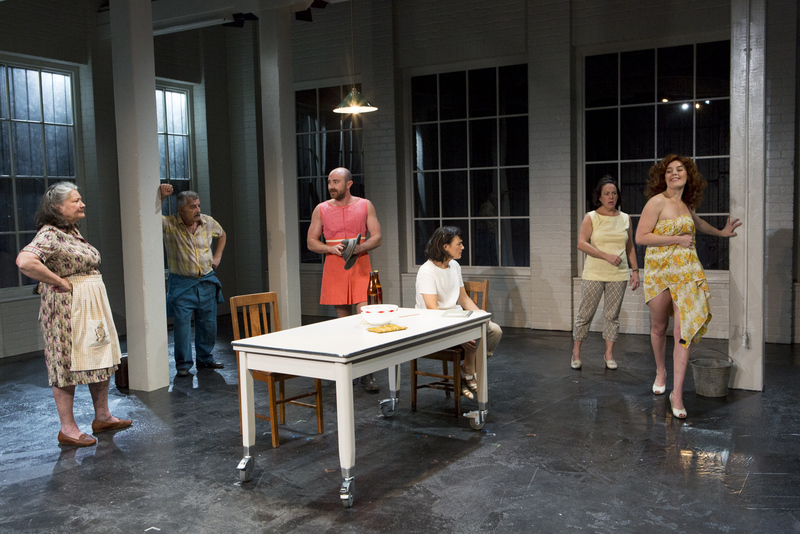 With an evocative, naturalistic design courtesy of Michael Hankin, whose large windows bathe the set in light, this production’s main emphasis is on narrative clarity. Although the first half has some slower passages, Goodes realises Valentine’s play with sensitivity, keeping the audience absorbed for two and something hours. Although critical of the more deleterious effects of urban renewal, The Sugar House remains a love letter to Sydney, albeit a complex one. So, do try and spend some time with the Macreadies if you can.